"If children live with acceptance, they learn to love." As I watched a family leave my office recently, I was reminded of a poem written many years ago by Dorothy Law Nolte, titled "Children Learn What They Live." This poem became a valuable anthem for parenting and is quoted often as a resource for raising loving children. The family I watched leave my office was experiencing distress and was not communicating or expressing themselves in a very accepting or loving manner, as is the case with so many families today. Teaching children how to love and to love well is one of the greatest challenges a parent will face. And the lessons of love always begin with the parent-child relationship. If children feel genuinely loved by their parents, they will know how to love others. 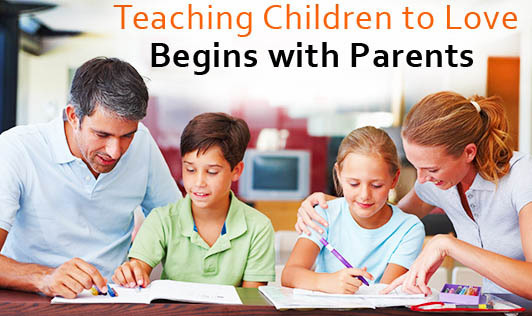 They will be more responsive to parental guidance in all areas of their lives. Children are behaviorally motivated and are most responsive to verbal expressions paired with actions. Hearing "I love you" when not connected with loving behavior leaves children feeling confused and insecure. When asking for love, children are often not subtle. They are noisy and may do things that seem inappropriate in order to gain parental approval and acceptance. It is important to realize that this is often the way children plead with their parents to spend time with them, to hold them and to give to them in a personal manner. A parent's response in these noisy, difficult times is crucial to a child's ability to grow into a loving, honest and secure adult. Children who are not taught to love often experience apprehension, self-pity, envy or guilt. These children are raised with criticism, hostility or fear. Many families today are under pressure from outside influences, such as the economy. Parents seem to be working harder and experiencing multiple stressors, which make it difficult to maintain a stable, secure home. Children raised without love and acceptance at home often turn to other sources and individuals for what they see as the security of being loved. These children often exhibit disrespect and exude anger, get into trouble in school and the community, become involved with individuals that are not suitable, or turn to drugs or alcohol for escape. During and after a divorce, children often need extra reassurance that they are loved. The emotional upheaval of divorce may cause children to question the permanency of parental love. This can only be addressed through sympathetic listening, processing emotions and staying the course. Children must be nurtured through grieving their losses if they are to develop an understanding of healthy love. This process is itself an act of love and involves parents listening much, talking less, helping children face reality, acknowledging hurt and empathizing with pain. Children need love messages that are tailored to their individual personalities and communication styles. No matter what love messages your child understands best, they need to be expressed unconditionally. Unconditional love means that a parent accepts the child and gives love freely even if the behavior is unacceptable. This is always the guiding light that enables parents to model the workings of a healthy relationship. Children raised with unconditional love learn to reciprocate and give this type of love in other relationships. With all that our high-tech world gives us, parents today have a most difficult task communicating with and teaching their children how to love and more importantly giving them the ability to recognize the signs of real love and acceptance.